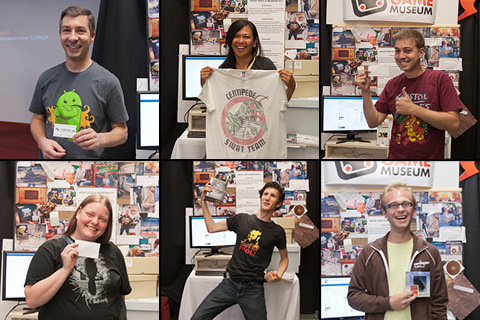 We celebrated Atari’s 40th year with the help of some friends. Cogswell Polytechnical College co-sponsored the event by providing the venue, we had excellent help from students Andrew and Steven, and Bill, Micah and Bob brought early game consoles and games to share play on. About 200 people joined us for the fun. Our honored guest, Al Alcorn, Atari employee #3 and designer of PONG, spoke on the early days of Atari, and several Atari folks from those days joined him to reminisce. 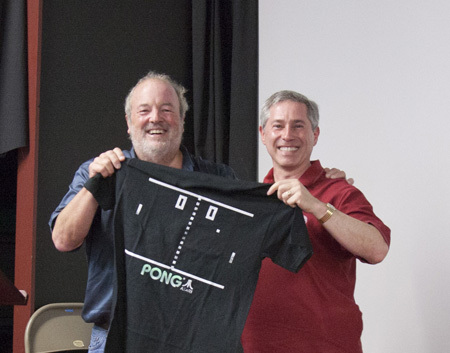 After the talk, Al awarded the PONG T-shirt from 80sTees to a lucky audience member. A special treat was provided by Jerry, who brought his arcade games, Computer Space #1 (yes,the first one ever made!) 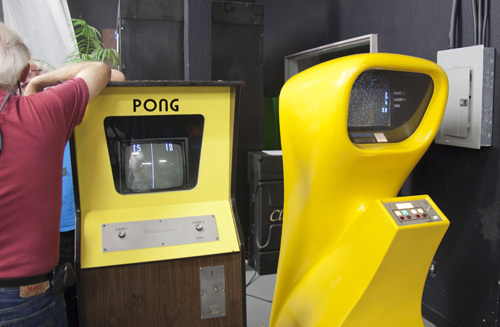 and PONG #32. Thanks to our generous sponsors, we were able to give away wonderful prizes: t-shirts from 80sTees, Zeemotes, Elgato’s HD Game recorders, Atari Development Kits from Atarimax, and Wii books from Classic Computer Magazine Archive. Everyone kept hydrated with water from Trader Joe’s and the volunteers were fueled with coffee from Starbucks. Our thanks to these generous supporters! What’s the fellow at the upper left holding? An original Syzygy business card that Al brought for us to give away. What a prize! He can be pretty sure none of his friends have one. We hope you were one of the lucky people who joined us for this special day. Visit the photo set and leave comments – is that you playing Centipede? Tell us about it! Let’s save the memories of this special event. One Comment on "Atari Party 2012 Pictures!" why the photo is only clothes? Transitioning to a new physical location. Watch this space for our new address!